During the session organized by Security Council, it was reported by Ahmed, UN envoy to Yemen, people are constantly attacked by Houthis Militias and in addition to this he has elencaed several zones, where there is a spread of landmines and weapons, used by Houthis Militias loyal to Ousted President. Meanwhile, O’Brien, head of office for Humanitarian affairs and Emergency Relief Coordination has said many civilians are being killed due to war and cholera disease. He has also said by reports one third of victims are children. The economy is decreasing and fuel and food prices are constantly increasing. Just one important event of this beginning week was prevention of a military operations in Houdaydah. Goldman Sachs Group Inc (GS.N)’s statement that it never transacted directly with the government of Venezuelan President Nicolas Maduro when it bought $2.8 billion of bonds for pennies on the dollar was dismissed by the country’s opposition on Tuesday as an effort to “put lipstick on this pig”. Goldman, in a statement late Monday confirming the purchase, said its asset-management arm acquired the bonds “on the secondary market from a broker and did not interact with the Venezuelan government”. The New York-based investment bank came under fire by Venezuelan politicians and protesters in New York opposed to Maduro, who say the deal nonetheless provided the cash-strapped government hundreds of millions of dollars in badly-needed hard currency. The deal, first reported by the Wall Street Journal, makes Goldman complicit in alleged human rights abuses under the government, they said. Serbia will continue to pursue close security cooperation with Russia in order to protect Serbia’s own national interests, in particular amid increasingly aggressive rhetoric from Kosovo Albanian politicians. Nobody can stop Serbia from cooperating with Russia in order to protect its national interests, Serbian Minister of Internal Affairs Nebojsa Stefanovic told Sputnik Srbija after returning from a trip to Russia last week. Stefanovic took part in a security conference in the city of Tver and met with Nikolai Patrushev, Secretary of the Russian Federation Security Council. The politicians signed a bilateral agreement on greater cooperation between Serbia’s Minister of Internal Affairs and the Russian Federal Security Service. “We want to cooperate with Russia as well as all other countries. On the other hand, I never heard for example China or Russia object to cooperation with other EU countries or the USA and so I think that kind of fear is unfounded.” Serbs are scared that Albanian politician in Kosovo want to invade Serbia to create what they call a “Greater Albania”. So, the agreement between Russia and Serbia on security cooperation could prevent this scenario some way (on the serbs point of view). The more the Kosovo general elections come closer, the more the tensions rise between these two countries. Minister of Interior of Montenegro Mevludin Nuhodžić, Minister of Interior of Albania Dritan Demiraj and Deputy Minister of Interior of Kosovo Valdet Hoxha sined a Protocol for establishing the Joint Centre for Police Cooperation in Plav. This protocol will include exchange of information to fight against crime and make activities more effective at national borders. The Montenegrin minister said that this will help safeguard the stability of the region by fighting against transnational criminal organizations. The Kosovo Minister has also been fully in agreement with what he said, asserting that the protocol itself will make the region safer and will also help to monitor the phenomenon of illegal immigration and human trafficking. German Ambassador to Montenegro Hans Günther congratulated the governments of Montenegro, Albania and Kosovo, saying that Germany will support this kind of acts of cooperation, and so did the US Ambassador to Montenegro Margaret Ann Uyehara. Kosovo: Kfor, esercitazione per garantire sicurezza al monastero di Decane. Iraq’s Shiite Hashd al-Shaabi paramilitaries have discovered 10 mass graves in areas they recently captured from ISIS militants in the Shingal region. These areas previously have been inaccessible to families of the victims, as well as local and international investigators. Rudaw’s Tahseen Qasim in Shingal reported that the Hashd al-Shaabi located three mass graves in the Siba Sheikh Khidir complex in the south of Shingal and another two in the Girzirgski complex. Qasim added five more mass graves were also discovered in Kocho village. Representatives of the Kurdistan Regional Government have used satellite imagery to identify many areas that likely contain mass graves; however, because of safety concerns and political differences, Kurdish investigators have been unable to go actually to the sites on the ground even when survivors like Yezidis provide testimony and evidence. A Yezidi member of the Iraqi parliament announced yesterday through a statement on the Kurdistan Democratic Party (KDP) website that Yezidis will soon open an online repository for the documentation of ISIS atrocities. “We will launch an online museum in the near future in order to be able to document all the atrocities committed against our community,” Vian Dakhil wrote in the statement. “Everyone could send their stories to the museum and their evidence will officially in one of the documenting agencies in the world will be registered”. Kocho, the hometown of the UN Goodwill Ambassador Nadia Murad, is a symbol of ISIS atrocities against Yezidi people. It is 18 kilometers south of Shingal town. Some 4,000 Yezidis used to inhabit it. When ISIS militants attacked Shingal and its surroundings in August 2014, they arrested thousands of Yezidis, many from the village of Kocho. Some of them were collectively killed in the village, other girls and women were sold or taken by ISIS members. The fates of thousands of Yezidis still remain unclear. “There have been over 40 mass graves found in Sinjar. I am horrified by the thought of the remains of six of my brothers in those graves, along with 700 other Yazidis who were summarily executed on the 15th of August 2014,” Murad said earlier this week. She partially laid the blame on the international community for what happened against the Yeizids by ISIS, explaining that in the period before the group besieged Kocho — prior to the massacre — Yezidis had asked for help. “Kocho is one of the capital crimes of 21st century”, she added. “It is with this in mind that I ask the liberating and security forces to preserve all findings, so there will be living evidence of the Islamic State crimes forever”. Shiite forces force announced it had reached the Syrian border on Monday. The Hashd al-Shaabi “made a miracle in the month of Ramadan” with their arrival at the Syrian border, Hadi al-Amiri, the secretary general of the Badr Organization, an influential military wing within the Hashd al-Shaabi, stated in an announcement published on their website. Last week the force declared it had cleared the town of Qairawan and its 13 villages and complexes, of which many were predominately Yezidi. A review of the 17 sustainable development goals of 2030 UNESCO Agenda shows that it does not contradict Iran’s Constitution and tenets of Islam, said a member of Education and Research Committee of Iran’s Parliament (Majlis). The 17 goals of the document are to a great extent in line with the Islamic Republic of Iran’s objectives, said Mahmoud Sadeghi, pointing to the 4th goal aimed at lifetime equal educational opportunities as an example. He added that Iran had declared reservations in implementing the document, particularly with regard to those parts that may be construed as contradictory to regulations and national priorities, religious teachings and cultural values of the Iranian society. Ending poverty in all forms and everywhere, ending hunger, providing food security, health and prosperity for every member at any age, as well as gender equality and empowering women and girls are among other goals of the agenda, according to the member of Parliament. Under one of the goals, for example, eliminating discrimination against women and girls is proposed, that may conflict with some views towards women rights in Iran, he said, adding that in the very case the national workgroup working on the agenda has used the term “justice” instead of “equality”. Iran has declared the reservation in implementing some parts of the 2030 agenda that are against Iran’s regulations or laws, added Sadeghi, emphasizing indigenizing the contradictory parts according to the values of each country as a solution to problematic areas. International Project Energa, An event related to energy and development, will be held in the Center Skenderija in the period from June 6 to 8, 2017. The event will bring together many companies, Such as British, Czech, Polish and German companies, and will enable many foreign investors to know the economic reality of Bosnia and Herzegovina better. This event will be held under the auspices of the Ministry of Foreign Trade and Economic Relations of BiH, the Ministry of Energy, Industry, and Mining of the FBiH, the Government of Canton Sarajevo and the City of Sarajevo. The other Partners of this project are Foreign Trade Chamber of BiH and the Chamber of Commerce of the FBiH. 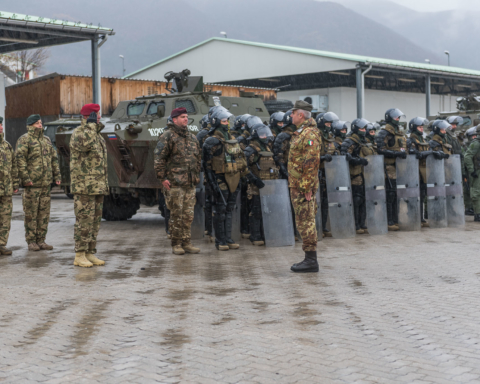 Kosovo, i medici militari italiani visitano la popolazione per il "White Sunday"
Nella seconda e terza settimana di maggio, si sono svolte delle attività sanitarie a favore delle popolazione civile organizzate e condotte dal Multinational Battle Group West (MNBG-W), unità multinazionale a guida italiana attualmente su base 32° Reggimento Carri, in stretta collaborazione con il Joint Regional Detachment South (JRD-S) di KFOR. Il team sanitario ha effettuato congiuntamente con gli assetti sanitari sloveni e austriaci, 80 visite mediche nel villaggio Restelica e 40 visite nel villaggio di Hoca. L’attività di assistenza medica a favore della popolazione civile è stata denominata “White Sunday” e rientra fra i programmi di cooperazione civile militare portati avanti da KFOR sotto il comando del Generale di Divisione Giovanni Fungo e dal contingente italiano d’istanza a Belo Poje. 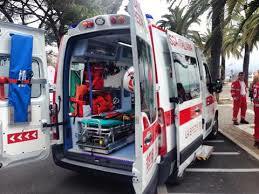 Gli assetti nazionali CIMIC concorrono attivamente a realizzare progetti a sostegno della popolazione locale in particolare nei settori sanitario, scolastico, sportivo e infrastrutturale. 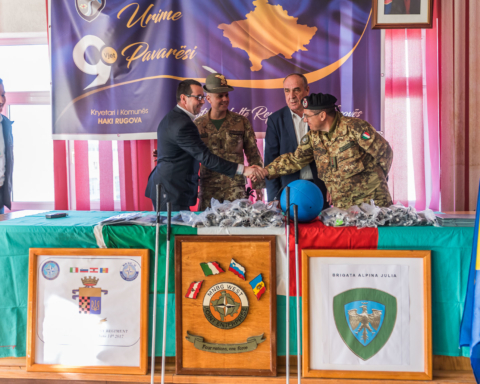 Lo sviluppo di attività di cooperazione civile-militare contribuiscono al miglioramento ed alla stabilizzazione del Kosovo. Si è celebratoil 29 maggio l’ “International Day of United Nations Peacekeepers”, a memoria di tutti i militari e civili delle Nazioni Unite che hanno perso la vita nelle operazioni di mantenimento della pace nelle aree più difficili del pianeta. La Missione UNIFIL (United Nations Interim Force in Lebanon), nata nel 1978 con le Risoluzioni n.425 e n.426 del Consiglio di Sicurezza delle Nazioni Unite, vede la sua attuale configurazione di oltre diecimila peacekeepers a seguito del conflitto tra Libano e Israele nel 2006, anno in cui fu incrementato il numero di caschi blu nel Sud del paese dei cedri a seguito della Risoluzione n.1701. UNIFIL ha visto al suo comando ben tre Ufficiali Generali italiani e la guida permanente del settore occidentale con la Joint Task Force – Lebanon Sector West, attualmente su base Brigata “Granatieri di Sardegna” e con a capo il Gen.B. Francesco OLLA. Even World Health Organization has declared there are 7.5 million people, who live in contagious area, and many of them are at risk of cholera. Due to the civil Yemeni war, health conditions and services got worsed and this has led to malnutrition, dirty water and food shortages. According to general Director of United Nations Fund for Arab Region, it has been increased number of death among pregnant women and this should be considered the worst humanitarian disaster in the last decades. This situation is due to malnutrition and displacement. This war has seriously affected the health local and national service, and actually just 30% of national sanitation service is available.